A new Florida law gives drivers the option to identify themselves as hearing impaired when registering a car or renewing their driver’s license. About 48 million Americans are hard of hearing, engaging in all of the activities that people with normal hearing do. However, for people with hearing loss, there are special concerns when it comes to daily activities and interactions. Imagine driving down the street and not hearing the honking of a horn or the blare of a siren from an emergency vehicle. Your sense of hearing is incredibly important in these moments. Two years ago, a hearing-impaired driver was killed by a state trooper in North Carolina when he failed to pull over because he didn’t hear the siren from the trooper’s squad car. This is an extreme case, but misunderstandings happen every day because law enforcement and emergency personnel are required to make split second decisions and sometimes that can’t happen when dealing with the hearing impaired. The North Carolina tragedy inspired Tallahassee police lieutenant Robert Di-Gonzalez to start networking with lawmakers on a system for hearing impairment to be noted on driver’s licenses and license plates. The license plate provision is particularly important because law enforcement personnel are aware immediately when they run a license plate that they need to make sure the hearing-impaired driver is totally aware of what is happening. The incident in North Carolina was especially important to Lieutenant Di-Gonzalez, as his son was born with 40% hearing loss. “Being the parents of a child that’s hearing impaired – that’s a big concern for us especially when he was learning to drive,” said Lieutenant Di-Gonzalez. The new law is the first of its kind in the country. Some states have tried hearing impaired identification cards, but the law enforcement officer must stop the person before seeing this ID, which opens up more space for a confrontation beforehand. Having a tag registry for the hearing impaired – or having that noted on a license plate – gives officers a heads-up immediately that the person they are pulling over or trying to pull over is deaf or hearing impaired. Once the driver has stopped, law enforcement personnel who are not fluent in American Sign Language are encouraged to use paper and pen to make sure they are communicating accurately with the deaf or hearing-impaired driver. All law enforcement agencies are required by federal law to make sure they are effectively communicating with the hearing impaired. This includes using sign language interpreters or assistive listening devices. However, it is not possible to ensure that every officer that pulls someone over can provide interpretive services at that time. 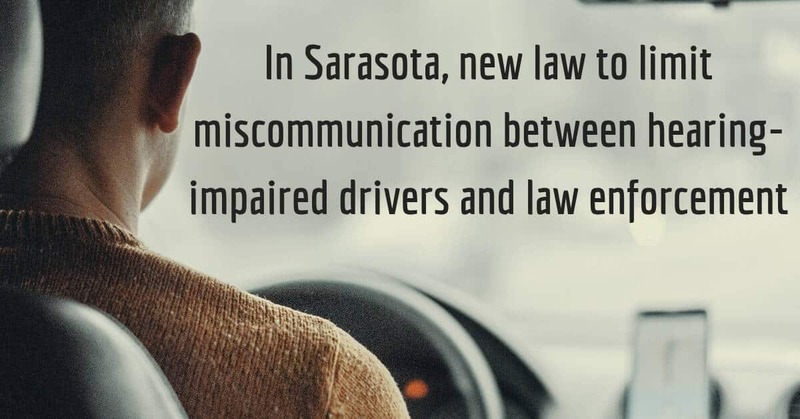 The officer should take all actions to communicate effectively with the hearing-impaired driver, eif that means passing a pen and paper back and forth to exchange information. It follows that if you need a public defender, he or she should be able to communicate with you effectively. Accommodations must be made at court appearances for the hearing impaired. This includes court appearances made by video appearances which are favored by law enforcement agencies for initial court appearances. A number of human service agencies in states around the country provide hard of hearing or deaf individuals with large cards that attach to a car’s visor. The two-sided card allows individuals to communicate with law enforcement personnel that they are deaf or hard of hearing and it offers tips and advice on how to communicate with them effectively. The card includes graphics that show car problems or common traffic violations. The driver and the officer or trooper can point to the appropriate items on the card during the stop. The cards come with specific information on where to place them on the visor, so they are visible when an officer walks up to the car. If you’ve noticed changes in your hearing, the first step towards general safety is to get a regular hearing test. The Gulf Gate Hearing Aid Center team provides comprehensive hearing tests and offer solutions to meet your hearing needs. Taking care of your hearing is important for many reasons – not least of which safety while on the road – and a regular hearing test at Gulf Gate Hearing Aid Center will help you maintain your hearing health.